â€œWhat on Earth are you doing?â€�. â€�We are making a trap for a thiefâ€� replied 4 and 5 year old Olav and Wilhelm in chorus. They are sitting on the ground outside the tent and playing intensely with string, tent pegs and sticks. It is late in the evening and we are on TromÃ¸ya outside of Arendal. For Olav and Wilhelm this is their first camping trip together, Wilhelms little brother is also along as well as their fathers who thought that it would be a good idea to combine their interest for paddling with the family holiday. This evening was particularly sucessful. It was summer and warm. The children were happy and we confirmed all our previous theories that it would be a good thing to do. Just pack the tent, sleeping bags, clothes, cooking gear and food in a double kayakk, put the kids in the front cockpit and paddle off into the blue. 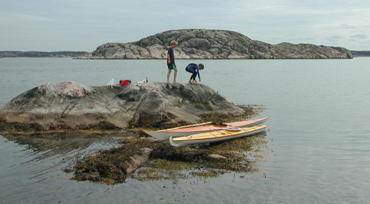 This was our first extended kayak trip with the children, from TromÃ¸ya to Nevlunghavn, we used one week. We were lucky with the weather, an important factor, and kayaking with the children has now become an important part of our summer holidays. Originally we were a group of two adults and three children, but friends and family have gradually joined in, we are now a small fleet of 6 kayaks, 6 adults and 9 children, all boys! Being such a large group is enjoyable but we are now big enough with regard to finding suitable camp sites. We take consideration for other campers and try to keep much to ourselves and preferably find a camp site out in the archipelago. Our camp site looks more like a tinkers camp with clothes lines running between the tents, kayaks, pots and pans, nappies and kids everywhere. We often wonder why more parents donâ€™t do this, and thought that this brief report may inspire others to take what we feel is the ultimate holiday with children. We felt that we had too little time on the water after bringing children into the world and wanted to share with them part of that we enjoy most: nature, outdoor pursuits and kayaking. There are a few requirements for a holiday like this. For your own and your childrens sake, good weather is a must. Wind makes paddling difficult and prolonged rain is depressing. We have traditionally paddled at the end of July or beginning of August, a period that usually is blessed with stable weather, so far we have been lucky! Location is also important, we have chosen the south of Norway or the west coast of Sweden. 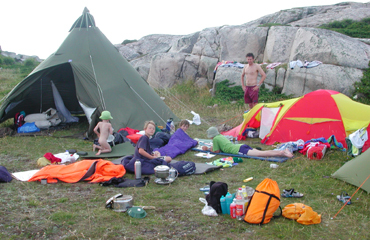 The latter has been highly succesful due to the lack of private shorelines, great camping sites and good weather. Apart from that the children think it is cool to be abroad where they speak a strange language and the money is different. Last summer holiday started by driving to StrÃ¸mstad where we parked the cars, loaded up the kayaks and were on the water by the afternoon. 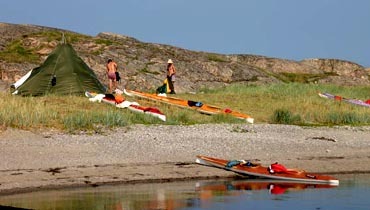 We had a fantastic weeks paddling in the archipelago south of StrÃ¸mstad. Highly recommended for families as well as â€œnormalâ€� kayakers. Logistics are easier if you can return back to the original launching site before the journey home. Safety needs to be taken seriously, but the only incident we have had so far was when Edward, 21/2 years old, was awakened by a wave spilling onto his lap. Being an experienced paddler makes certain choices easier and possibilities greater, but it is possible to take longer trips for the less experienced by being even more cautious and having a greater safety margin. Cold water ia always a danger for both adults and children, but children have less tolerance even on a warm summers day. We are never far from land and warm sleeping bags, dry clothing and warm drinks are always close to hand. There is also in our case safety in numbers which enables us to cross short stretches of open water if the weather allows it. 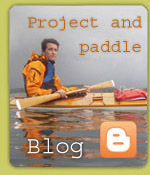 â€œWhat happens if a kayak capsisesâ€� is a relevant question. We theorised that we could deal with this eventuality but decided to test it out in practice 2 years ago. We selected a protected bay with a sandy bottom, the children had already been playing in the water and the weather was warm. We entered the kayak with an adult standing beside us in the water for safety. We capsised into the water as planned, both adult and child exited the kajak and surfaced with the help of proper life jackets. 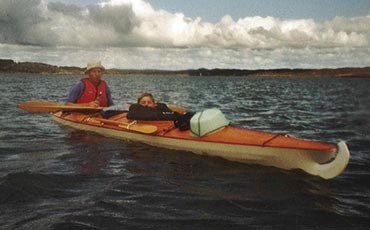 The adult could easily right the kayak, help the child back into the front cockpit, bale out the kajak, climb back in and paddle back to the shore. Safety and comfort go hand in hand. Dry, warm and a full belly are key words for a successful trip, these objectives should never be far away. In addition to suitable clothing, a first-aid kit should be part of the equipment, there are normally small cuts and grazes to be delt with, Sun protection is important, sunscreen, sunglasses and a hat are a must. Maps and a compass are a great help, the Swedish west coast is difficult to navigate, with so many islands and bays it is nearly impossible to find a camp site, shop etc from a map alone. We try not to organise too much on these trips. Part of the point is to get away from everyday life and take things as they come. But the daily routine tends to be much the same. We normally sleep as long as we can, you often wake early in a tent, but you can still lay in your sleeping bag. The first adult to get up usually starts up the Primus and boils water, we use a lot of water during the day and it takes some time to boil enough. We normally make sandwiches for the day during breakfast, these are readily accesible in the kayak together with cold and warm drinks. This way we can eat while still afloat if finding a suitable spot for lunch is difficult. After a long breakfast the adults drink coffee and the children play. Packing the kayak takes time, we use at least one hour from starting until we are ready to paddle! The first leg takes typically 1â€“11/2 hours and we paddle about 5â€“6 kms. We paddle 2 or 3 such legs during an average day of total 15 kms. This is a compromise between the adults and the childrens needs. The adults will paddle further and the children would rather be ashore, they enjoy paddling as long as each leg is not too far. When we agree on a new camp site we have to get organised again. Some put up the tent, others start making the dinner, while the children explore the island. After dinner the children play until they are tired. Normal bedtime hours we forget. We usually have a rest day ashore without paddling. This is always an interesting theme to discuss. Our equipment has worked perfectly, here are some of the most important items. We have always used a lavvo (traditional Sami tent) mostly because this is a very sociable way to camp together, and very comfortable. There is room to stand upright as well as spacious sleeping, storage and cooking areas. We have used a light model from Frisport with flysheet and groundsheet. The inner tent has not been used, but the groundsheet has been very practical. The advantage with the Lavvo is that you can light a fire in the tent and dry clothing in the event of rain or an accident. The main disadvantage is that the Lavvo catches a lot of wind and cannot be erected anywhere, but so far this has not been a problem on our trips. We have always found a large enough space protected from the wind. Plenty of clothes is an advantage! We use lots of wool and waterproofs for the children. If the weather is fine at the start of the days paddling we are lightly clothed, but the warm and waterproof clothing is close to hand. Remember that children are less active in the kayak than the adults who are paddling, and there is nearly always a slight breeze on the sea. In the event of a capsize changing into dry wool and waterproofs will quickly restore body heat. Rubber boots are often used ashore and its impossible to have too many woollen socks! Each family is responsible for food for their own breakfast and lunch plus one dinner for the entire group. Dinners are usually brought from home and we shop about every third day for bread, perishable foods and luxuries like sweets and ice cream for the children and beer for the adults. We have used methylated spirit (denatured alcohol) stoves for cooking which was fine when we were so few, but we now use a Primus and a large saucepan set. Thick bottomed saucepans work best on the Primus while thin bottomed are best for on the camp fire. 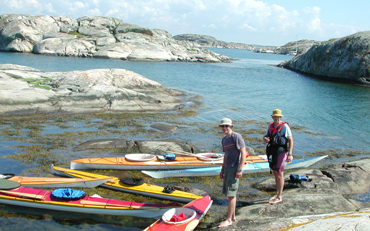 We have used various types of kayak, and have experienced that most sea kayaks are useable. Kleppers collapsible double â€œAerius Expeditionâ€� and Kajakkspesialistens skin on frame â€œBaidarka double have been used successfully for several years. 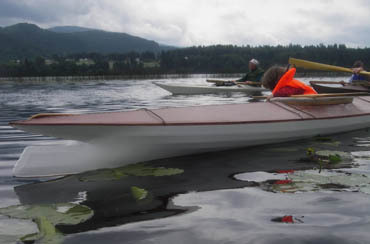 In addition various kayaks in plastic and fibreglass have been used. Stability and sea worthiness are the key words here. The kayak should not be too long or steering will be a problem in adverse weather. Oars for the children are a good idea, we hope our children will start using them more actively in the future! Deck packs are practical for easy access to items such as Thermos, drinks, lunch pack chocolate, sun screen, sun glasses etc. If you think this sounds like a good thing to try, here is some advice. Decide on an area to paddle and start planning with the help of others. Ask at your local kayak club if anyone else would like to join you. Work out the practical details in advance and have a back-up plan in case adverse weather prohibits paddling, Safety must also be discussed in advance and theories tried out in practice. Think about the worst case scenario and be prepared. Do not however be rigid in your planning, remember the most important ingredient in a successful trip is the childrens happiness. 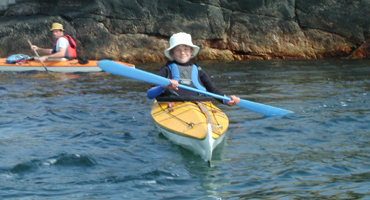 â€œAre we going paddling again soon?â€� Olav is 7 years old and planning next years trip. For his birthday he got a headlight and a camping saw and there is no doubt that they are going with him. â€œAre you taking your Gameboy?â€� I ask carefully. â€œNo, it will get wet and be ruinedâ€� he replies. Dad breathes a sigh of relief!